Of the many high profile cases that Mr. Sweeney has handled, he has stated that this was his most important and one of the most challenging. After three days of trial, in the United States District Court in Los Angeles, Universal offered to settle the case for a confidential amount. Fire fighter injured by an out of control vehicle while standing in front of his La Canada-Flintridge firehouse. After a month long jury trial, a verdict was returned for plaintiff rewarding him damages in excess of $2 million. The defendants appealed the verdict, the matter proceeded to the California Appellate Court where the verdict was confirmed in full. The defendants paid over 2.4 million which represented the amount of the jury verdict, plus interest. 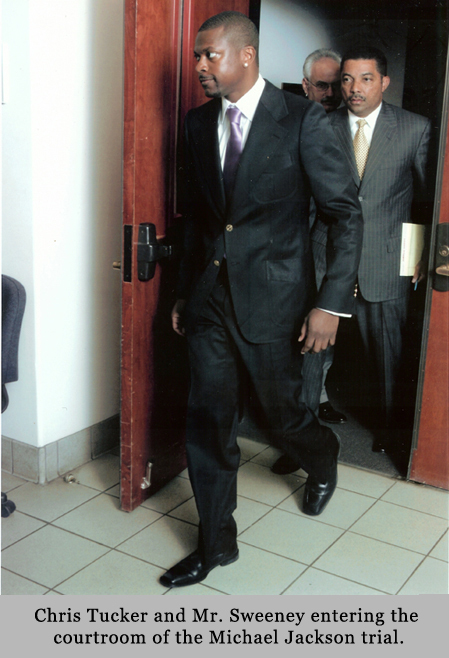 Mr. Sweeney represented the defense’s star witness, film superstar Chris Tucker, at the trial. Experts have stated that it was Chris Tucker’s testimony which convinced the jury that the victim was not truthful, which led to the Jackson acquittal. Death penalty murder case in which Temple was acquitted by a Los Angeles Superior Court jury of one count of murder and four counts of attempted murder. This was one of the few ‘not-guilty’ verdicts in a death penalty case in the history of the state of California. In that case, Mr. Sweeney received a very rare ‘not-guilty by reason of insanity’ verdict for his client. A $980,000 jury verdict was won on behalf of Ms. Estes. At the time, the largest elder abuse verdict in Orange County, California history. The tragic Baldwin Hills fire case, which involved the burning of seventy-five homes and the death of three people including Gladden’s mother. This was the largest tort litigation in Los Angeles court history with hundreds of parties involved. The case was settled for a confidential sum. The Gladden case put the firm on the map as a major force in mass tort litigation.